A Bangkok beggar donates to the flood crisis. 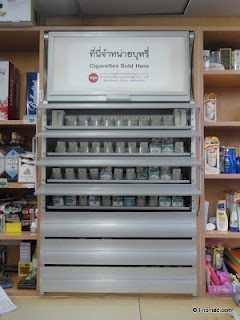 Surely not one of the worst examples: An almost empty cigarette shelf in a 7-Eleven outlet in one of the dry areas, Ao Nang, Krabi. The severe Thai flood crisis shown in the news all over the world, let many people assume all of Thailand is under water. Truth is that altough the South and mid-South had to deal with a major flood in the end of March and begin of April this year, in the last half year big part of the country especially in the North-East and South of Bangkok largely have remained unaffected. Besides the historic city of Ayutthaya and parts of Bangkok, only one major tourist destination, namely Chiang Mai, got flooded nearly one month ago, but has in the mean time been declared safe. Still, those travelers planning to visit one of the dry areas this season, have to take the aftermath of the crisis into consideration as well. The closing of Don Muang airport today has severely delayed or stopped people flying to tourist destinations like Phuket, Chiang Mai, Koh Samui and Krabi. At the same time the flood and the current insecure situation in Bangkok is having major effects on Bangkok as a logistic center. Shops and outlets in other areas are forced to pre-order scarce products in quantities as much as they can get hold of. 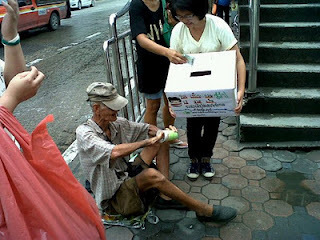 Despite the fact that the majority of Thai people seem to be unanimous to help eachother in these times of despair and are not willing to unselfishly profit from the situation, the unbalanced supply and demand mechanism has already started to get it’s grasp on retail prices. The situation is worsened by the fact that understandably an increasing number of people have turned into hoarding. Besides huge damages of the flood to industry and agriculture, tourism is bound to get a severe blow as well. Relying on official figures this segment is good for 6% of the gross domestic product, but it’s real impact is thought by some experts to be considerably higher. The Thai high season runs from November to April. Many entrepeneurs in the segment regard this period as a time when the profit for the rest of the year has to be made. A considerable decline in visitors in the coming half year could have a large additional negative impact on the economy of the Kingdom, which has already seen so much devastation this year.